The MCA has just completed a consultation about removing "grandfather rights" from existing domestic passenger vessels. The issues considered included life-raft provision, life-jacket provision, life-jacket lights, fire detection, fixed fire-fighting, containment of fire, mechanically powered fire and bilge pumps, bilge alarms and damage stability. Amongst these the most serious issue for historic ships is the question of damage stability which will affect different vessels in different ways. Some already comply with one compartment survivability because they were built like that. Others, like Kingswear Castle, don't. She has five bulkheads but the distance between them is greater than modern standards require. Fitting additional buoyancy instead is easier said than done. 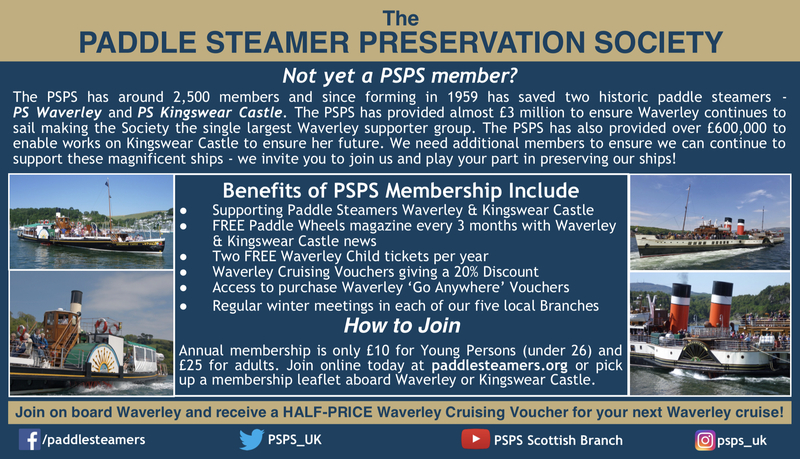 We have discussed all this with DPC at Dartmouth, as current operators of the ship, as well as with the MCA at Southampton and have submitted a formal response to the MCA consultation on behalf of the Paddle Steamer Kingswear Castle Trust as owners of the ship. We are hopeful that a solution to this can be found for KC because if it can't then this will see the end of her passenger carrying career. I have a further meeting with the MCA scheduled for later this month. There is to be a meeting between the MCA and industry in March which I will also attend. The MCA's current plan is to implement the changes in the autumn of this year with a view to them being phased in within the next two years although industry is currently pressing for this to be increased to five years.